Spacious Mountain Townhouse. Great Location! Come enjoy a luxury vacation away in the mountains. The unit was recently renovated and has all the comforts of home. First a little about our most current update: Our unit has been completely remodeled. We have wooden floors on the main floor and a large gas fireplace that is finished with stone. We have large sectional that seats seven. We have 65" new Sony - 65" Smart - 4K UHD TV with HDR. We have heated tile floors in the kitchen and bathrooms. Also, we have replaced all the cabinets in the kitchen and baths with knotty alder which are complimented with quartz counter tops. The two baths/showers have new travertine tiled walls. New stainless steel appliances are found throughout the kitchen. You will find the unit very upscale with everything to make your trip comfortable and memorable. Please come and relax in our beautiful, two bedroom, two and a half bath townhouse in Breckenridge. You will love all the special touches which will make your trip more enjoyable. This is a ski-in unit on Four O'clock Road, that is only one short block, less than 5 minute walk, to the Snowflake lift and only two blocks to Main Street in Breckenridge. Because it is a town home, you have a private, heated garage, which is directly connected to the unit by a door; and you will have no noisy neighbors either above or below you. One can easily ski in to the town home for lunch, down Four O'clock run, and then head right back out to the Snowflake lift to ski the rest of the day. The Non-Smoking town home is large, almost 1300 square feet. Bring your netflix and or hulu plus passwords and have easy access on the SMART TVs while on vacation. We also have open HDMI cord already plugged into TVs so that you can plug in your devices in either of the 2 SMART TVs. The unit has beautiful 6 panel pine doors! It really gives it a woodsy feel. The unit has many great features. 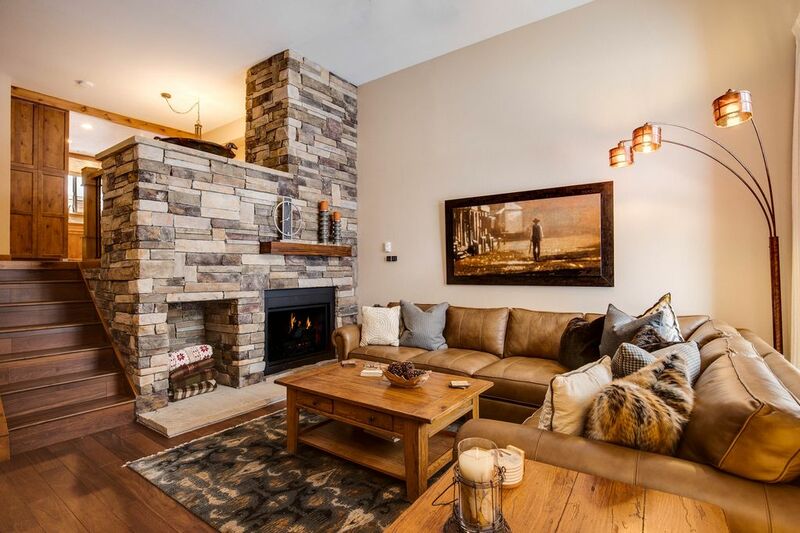 Sit back and enjoy the heat and look of our gas log fireplace. My favorite feature is the quietness of the unit, without having to listen to your neighbor's feet banging on the ceiling or the conversation next door. This unit has great sleeping arrangements that will have everyone sleeping in late. You can cook a gourmet meal with a completely stocked kitchen with everything you need to feed an army in this large kitchen and eating area. You will absolutely love this place and want to come back to our Winterpoint town home with your loved ones year after year. All returning visitors will receive a 10% discount! NEW: We have added a guest liaison, Lisa, who is in Breckenridge and will help with check-in and any other needs that you have. You will love her and this unique service, which is free of charge for you! When we bought our townhouse we lived in Colorado Springs. We now live with our four children in Madison, WI. We love to ski, snow board, and hike the nearby, beautiful mountain trails. We put all the special touches into our place that we would want. We hope you enjoy our townhome. Breckenridge is a small, quaint town and mountain community. You can walk to everything here. The only time we get into our car is to arrive, get groceries, or to leave town. There is so much to do both in the winter and summer from sledding to the Jazz Festival to the rugby winter tournament called the St. Valentines Day Massacre rugby tournament. Come visit and you will see why! As a town home, the privacy, spaciousness, and quietness is uncomparable to the common condo. No guests above you or below you. It is rare that you will ever hear anyone. You will have a private garage, private laundry room with full size washer and dryer, and fully stocked kitchen. The sleeping areas are on the top floor and the main living area is down the stairs and out of ear shot from that. If you want to hear the baby, bring the baby monitor. We have a pack and play and high chair that hooks onto the counter. This will save a ton of space during your travel. The garage is heated and includes plenty of room for all your skis, snowboards, coats, gloves, and helmets. We are very close to town and the slopes, so the car is obsolete. We have a fully stocked kitchen with all the cookware you will need to make Thanksgiving dinner. We also have a large assortment of spices, oils, flour, sugar, etc.